Reusing old materials for new things is a great way to be eco-friendly and to upcycle. 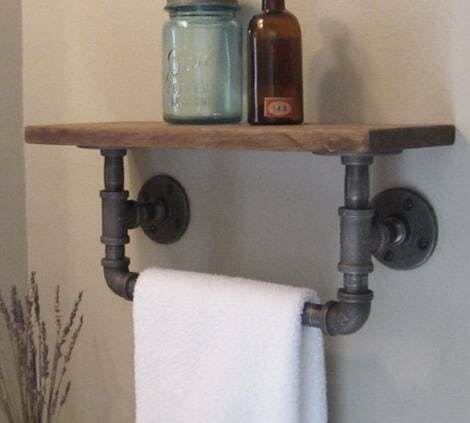 Old plumbing can be used for many DIY projects around your home. Old plumbing pipe is a great option too for a look that is more industrial, like this dining table or this coffee table. You can easily find pieces of pipe which attach to various fittings to complete many types of pipe projects. The types of pipe projects that are available depend on the results you desire. You typically need a variety of tools to complete many types of DIY projects that require plumbing pipe. A pipe wrench is one tool you will need that is available at any hardware store or local home improvement store. If you want to make an art piece, some furniture, or other pipe projects to use at home, then wood and screws may be needed. Attaching pieces of pipe for most pipe projects means by using other materials, such as wood. Wood is an ideal material to use as a base or the frame for most DIY projects. You can easily cut wood by using most types of saws. If you do not have a saw, then see if a friend or family member can help cut the wood that you need for a particular project. The options you have for project ideas is almost limitless.